GeoTeric 2017.2 continues to expand on our Adaptive Interpretation system by introducing Adaptive Fault Interpretation. 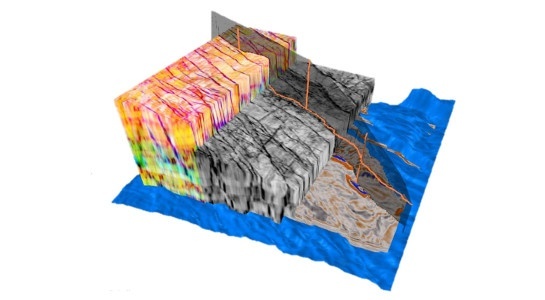 Our new Adaptive Faults use Regional Structural Awareness to guide the fault sticks through the data, whilst still allowing the interpreter full control over the end results. Since it’s based on GeoTeric’s patent pending Graph Theory approach, it will also show the user different alternative paths as you interpret your data. Data following fault sticks increase the resolution and precision of structural interpretation. Interpret directly on reflectivity, attributes or blends in 2D or 3D. Automatic preview of surface generation for rapid QC whilst you interpret. Easy editing of fault sticks in a similar way to Adaptive Horizons. Interpret fault sticks on Arbitrary Lines. Full support for floating point data throughout GeoTeric. Adaptive Horizons can now be tracked on Arbitrary Lines. Well correlation panel now allows you adjust the synthetic in either time or depth domain. Several performance and interactivity issues resolved in order to ensure a smooth interpretation experience. Faster SEG-Y header scan and IsoProportional Slicing export. GeoTeric is now compatible with Petrel 2017. Find out more about the release videos and more. Request to download GeoTeric 2017.2.